The What: Raritan, a provider of intelligent data center management and rack power distribution, has added new security and performance features for its Dominion KX III User Station at the Department of Defense Intelligence Information Systems (DoDIIS) Worldwide Conference. 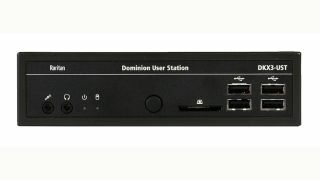 The What Else: The User Station simplifies how IT professionals access and manage multiple servers and other devices connected to Raritan’s Dominion KX III KVM switch. Both the KX III and User Station now meet widely used U.S. government security mandates, including smart card/CAC authentication; LDAP, RADIUS or active directory authentication; certified FIPS 140-2 cryptographic module; 256-bit AES or 128-bit RC4 encryption; and dual-stack networking: IPv4 and IPv6. The User Station’s Intel-based platform supports two 1080p streaming video sessions at 30Hz, and is small enough to sit on a desk or be mounted in a standard 19-inch data center rack slot. According to Richard Dominach, director of product management at Raritan, the User Station can replace outdated analog matrix switches or expensive, inflexible broadcast systems, and can be used in environments where a PC is not wanted. The Bottom Line: Raritan will exhibit at DoDIIS, in booth 936, to showcase the new User Station, KX III KVM switch, intelligent rack PDUs, and SX II Serial Console Server for managing serial devices such as routers, switches, and blade servers. These solutions also will be shown at Los Alamos National Laboratory Tech Expo, October 24; Kirtland AFB Tech Expo, October 25; and Holloman AFB Tech Expo, October 27.